Underwood no. 1 #12880-1 (ca. 1901): At first glance, just another Underwood. But when you look closely, nearly every part of this Wagner-made machine is different from later models. One quick giveaway: the ribbon crank on the left. Later Underwoods have the crank only on the right, and you shift it left or right to control different spools. (This system was introduced sometime after 1903; see comments below.) The familiar Underwood name is there, but there is no shield logo. There is no bicolor ribbon mechanism (although I've inappropriately put a bicolor ribbon into the machine). To get a period, you have to shift. There is only one true shift key, on the left; the big key on the right is the shift lock. This Underwood is also considerably lighter than the others I'm showing here. This is one of the last model 1's made; I expect that earlier ones would show even more features that were discontinued as the machine evolved. Underwood no. 5 #446304 (1911): This is the oldest typewriter belonging to WordPlay; I've shown it on my blog before. I brought it home for a little extra tune-up. At this point the company had much more experience. There are many changes as compared to the model 1, such as the seesaw ribbon color selector. But that key on the right is still a shift lock. Underwood no. 5 #2096819-5 (1925): The company has now made over two million no. 5's, constantly improving the details and even subtly changing the shape of the frame (it's a bit more rounded). The typewriter now has two true shift keys, and the return lever is a little less stubby. This typewriter used to belong to Whitman College in Walla Walla, Washington; the college gave it to me when I was living in Walla Walla for a year. 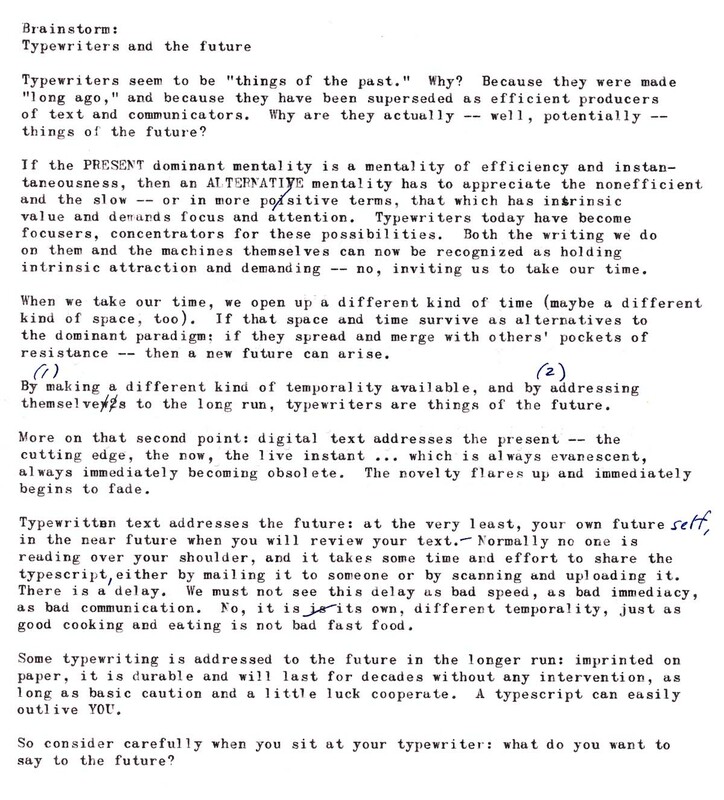 It is one of the most pictured typewriters on the Internet, thanks to its prominent appearance on The Classic Typewriter Page. Underwood no. 6 #4134815-11 (1933): The "-11" designates an eleven-inch platen. The front panel now has indentations, and there are other subtle stylistic changes, but the main new feature on this machine is a decimal tabulator with key-set tab stops and tab clear, all at the top of the keyboard. The bicolor seesaw has been replaced by a more inconspicuous switch. This machine was advertised on Craigslist by a Habitat for Humanity ReStock store, and I've fixed it up for WordPlay. 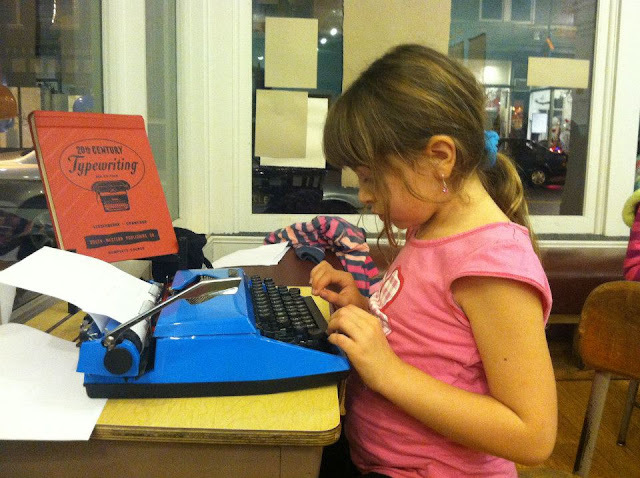 Probably it will go on sale rather than being used by the kids -- we're starting a little typewriter shop inside WordPlay! Underwood Master no. #4859788-11 (1938): Another Craigslist find for WordPlay. This design starts to cover up the works of the machine using wrinkle-paint panels, which make a handsome contrast with the glossy black frame. It uses a paper bail instead of the awkward fingers of previous models. Its tabulator bar is flanked by keys to set and clear tab stops. The remnants of the Underwood logo on the paper table came off during intensive cleaning with Scrubbing Bubbles. Underwood S #S11-5752950 (1943): That's what the database says, this typewriter was made during World War II. Apparently Underwood typewriter production stopped only during 1944. As for the design, the wrinkle paint has now taken over and the front panel completely covers the typebars. It looks like a serious, military typewriter. A new feature, a little knob for touch adjustment, protrudes from the left top of the panel. This typewriter was given to me by the mother of a student. Underwood SX-100 #13-7352510 (1953): I'm identifying the model using Will Davis' Underwood Gallery. This one is a donation to WordPlay which required lots of cleaning (it looked brown when it first came in). The front panel is missing, but otherwise everything is working well now; I used it to type today's typecast. 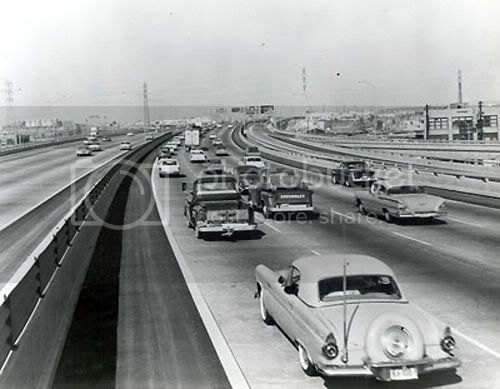 A lot has happened in the decade since the model S above. It's still recognizably an Underwood, with familiar features such as the margin stops in front and the hook on the right of the carriage, which go back to the model 1; but there are many mechanical innovations. The biggest is basket shift. This had been a feature of the L. C. Smith from the start; in the '30s, makes such as Royal and Remington adopted it; and this Underwood finally has it too. Also striking is the big carriage return lever, considerably easier than the traditional design -- but it has crowded out the lefthand carriage release, which is unfortunately gone on this model. As for the design, a WordPlay volunteer told me she thought it was the prettiest typewriter she'd ever seen -- and that was before cleaning. I didn't believe her, but I have to say that when it's clean, it has a certain gray-flannel-suit handsomeness to it. The stripes on the side are a kind of ridiculous gesture in the direction of Art Deco, which was already an old-fashioned esthetic by 1953 -- but I like them anyway. This is not the end of the Underwood story. The database says Underwood standards were made until at least 1968 -- nearly ten million in all. See a very late Underwood here. Excuse the mess ... this is a first draft. I've been seeing more and more fake typewriters for sale. 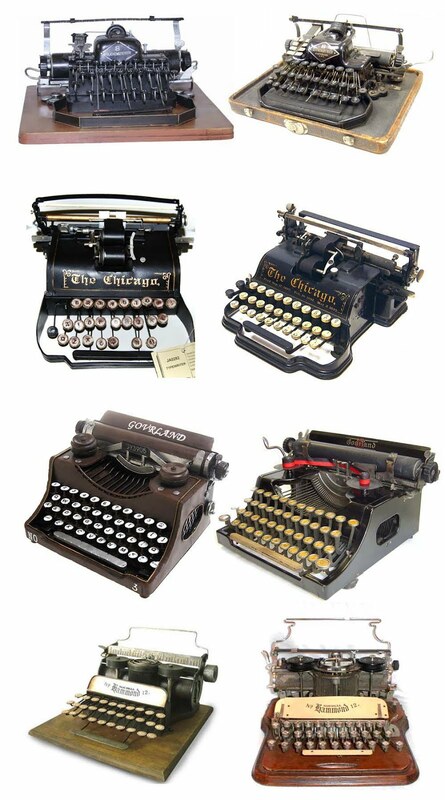 These are made in China and definitely take some ingenuity and skilled labor to design and assemble (not as much as real manual typewriters, of course -- which are also made in China). I expect that some, if not all of these are based on photos -- it's not easy to get your hands on a Gourland, after all. They seem to be designed to provide some charm and atmosphere to a display in a store, and to be appreciated at a glance or as part of an overall effect -- not to be scrutinized close up, much less used. Coincidentally, maschinengeschrieben just showed us a Louis Vuitton window display in Zurich featuring some beautiful custom-made faux typewriters. What should we make of this trend? 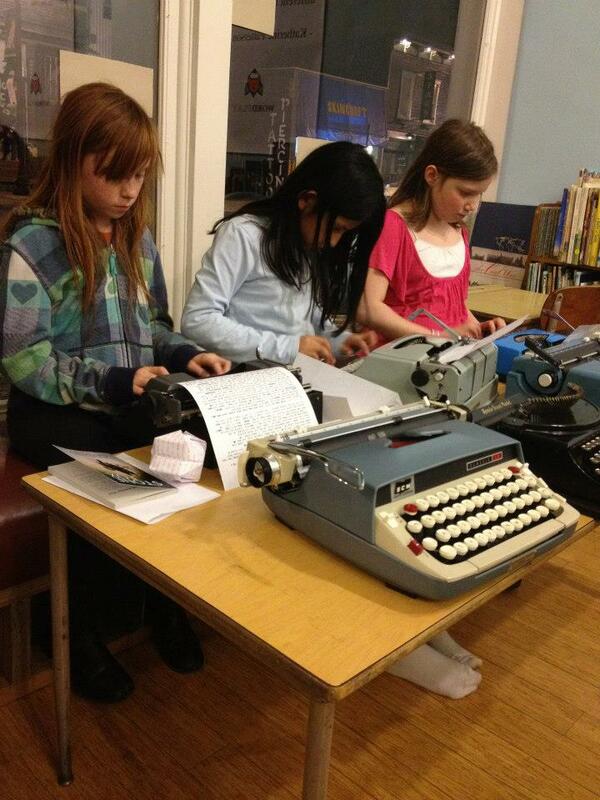 Are these objects pathetic travesties, or another positive sign that people are taking an interest in typewriters? Compare these fakes to the originals and see what you think. 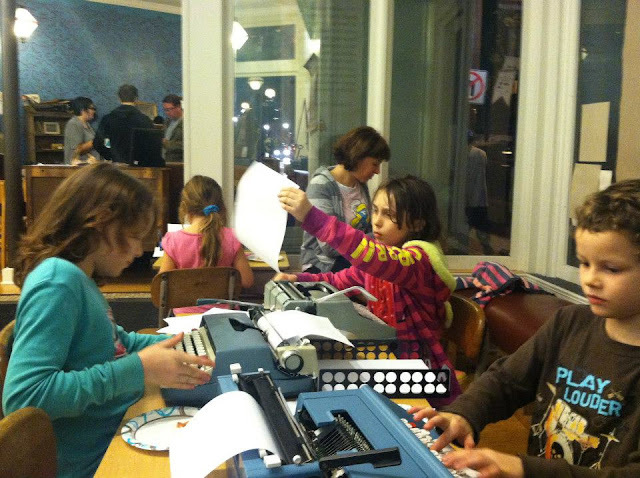 This new video shows WordPlay in action, featuring an interview with director Libby Hunter and a look at the role that typewriters play in the kids' activities. You can also visit Wordplay's website and Facebook page. Here are a few of their recent Facebook photos. Inspector Louis Kehlweiler doesn't know what's in the basement. If you want to know, just be the first to send me your address ... but you'll have to find out in French or Spanish. A friend of my father gave me this fine mystery novel in both languages; it hasn't been translated into English yet. I translated this scene from the Spanish. Here's a quick rendering of a concept for the book cover. 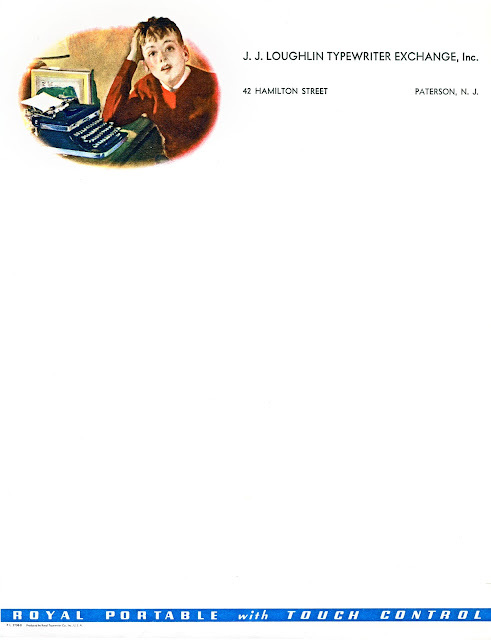 Of course the cover would use real typing instead of this typewriter font! For the moment I'm borrowing a bit of Georg's beautiful ribbon photography. 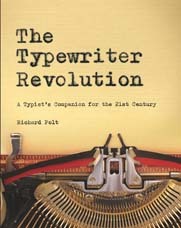 Here I got the subtitle right: "A Field Manual for the Typewritten Revolution," not "A Field Guide to the Typewritten Revolution," as I had it in my previous posts. A field guide is for naturalists with binoculars; a field manual is for combatants. Thanks for all your comments and suggestions on the book concept. You can still leave more at any time, they will always get to me (or write me directly at polt@xavier.edu). I'll keep everyone posted. This stationery is a present for all of us from ephemera collector extraordinaire Peter Weil. Just click on it to see it in high resolution. Thanks, Peter!